This coming season marks the 50th anniversary of the Jets’ second division title in 1969. Now, 50 years later, the team has won the division … four times. Crowns in 1998 and 2002 make for the only other firsts on the Jets’ resume. In the last decade, a pair of second-place finishes and Wild Cards came at the beginning, but the team has finished in last place in the AFC East four of the last five years. Since 2010, in fact, the Jets have exactly one season above .500, an out-of-nowhere 2015 aberration that we’ll get to a lot below in this space. Otherwise, it’s been a bad run for the franchise. Let’s take a look at the best Jets fantasy seasons of the last decade. 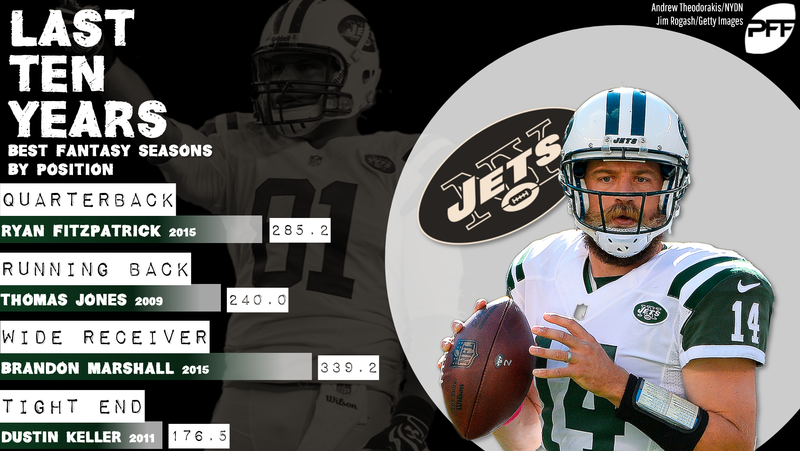 For a long stretch of his career, Fitzpatrick was just good enough to hang around. He bounced from Cincinnati to Buffalo to Tennessee to Houston before landing with the Jets in 2015. And then his numbers skyrocketed. He put up seven more touchdowns than he ever had before while not materially changing his interception percentage. The Jets, buying into a guy in his early-mid 30s suddenly finding a new level, brought Fitzpatrick back for 2016 … and he promptly re-became himself, putting up a 12:17 TD:INT ratio in his second (and last) year as a Jet. Teams that Jones’ 2009 would have led in this exercise: These Jets and the Detroit Lions. And the Lions’ RB struggles have been well chronicled. The Jets’ issues might not have gotten as much publicity, but Jones in 2009 is the only running back in the last decade to even top 220 PPR points for the team. LaDainian Tomlinson, Shonn Greene, and Matt Forte have all been varying degrees of “just good enough” without actually being strong fantasy plays. Jones’ good year in 2009 stands well above them, though. Marshall’s 2015 season tops the list for the Jets. In second place was Eric Decker in … 2015 as well. The Jets haven’t gotten much from the receiver position in our sample, but 2015 was a strong year, with Decker finishing as the PPR WR13. As mentioned above, the Jets basically tried to run it back in 2016, but Decker got hurt, Marshall saw his yardage cut almost in half from 1,502 to 788, and the team went from 10-6 to 5-11. Thank goodness for Keller, because if he hadn’t existed for the Jets, their best TE season in a whole decade would have been Chris Herndon’s 2018 rookie year. And don’t get me wrong, Herndon looked good as a rookie and is promising for the future, but he had 502 yards and 4 TDs. It would be sad if that led a team. (Please don’t go back and read the Cardinals piece in this series.) Unfortunately, it didn’t last long for Keller after 2011 — he got hurt in 2012, signed with Miami that offseason, and then got hurt so badly in the preseason his career ended.